How do I change my website being tracked in Tailwind? 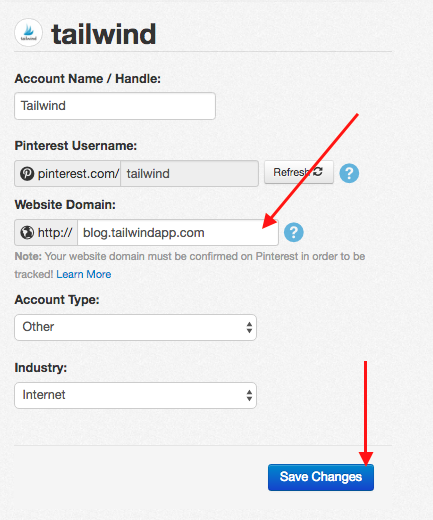 Update your website address within Tailwind in a few simple steps. If you've just moved over to a new website, changing clients or Pinterest username, then you'll want to also update your website address within Tailwind. This way when we go to pull data from your Pinterest account for Monitor Your Domain, the websites match both within Tailwind and on Pinterest. Go to your Account Settings (located in the settings menu in the top right hand navigation). 2. Click into the textbox where the current website is listed and enter the new website. Your website domain must be confirmed on Pinterest in order to be tracked! "http://" and "www" not required. Only domains or subdomains can be tracked. 3. Don't forget to Save Changes! Note: Your website domain must be confirmed on Pinterest in order to be tracked! Learn More from Pinterest's Help Site.